Another long day driving 304 miles. The route took us south beside Lake Michigan's Green Bay, then southwest across Wisconsin. It was almost all 2 lane roads at 55 mph and the View achieved 19.6 mpg. Central time starts when you cross the Menominee River into Wisconsin. Menominee MI is on one side and Marinette WI on the other. Talk about confusing since it all looks like one town. 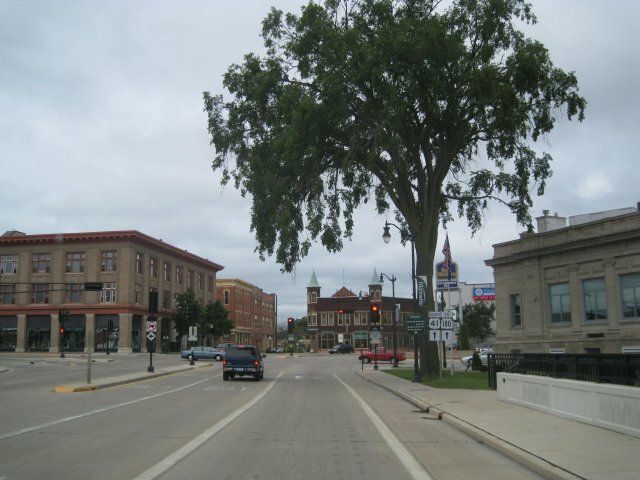 We were particularly impressed with the prosperous look of Marinette (see photo). There are a lot of older aluminum cruisers with the Marinette name. Now I know where the name came from. Tomorrow we have just a couple of hundred miles to reach Forest City IA, the site of the Winnebago Grand National Rally and the Winnebago factory. We expect to stay there all week.